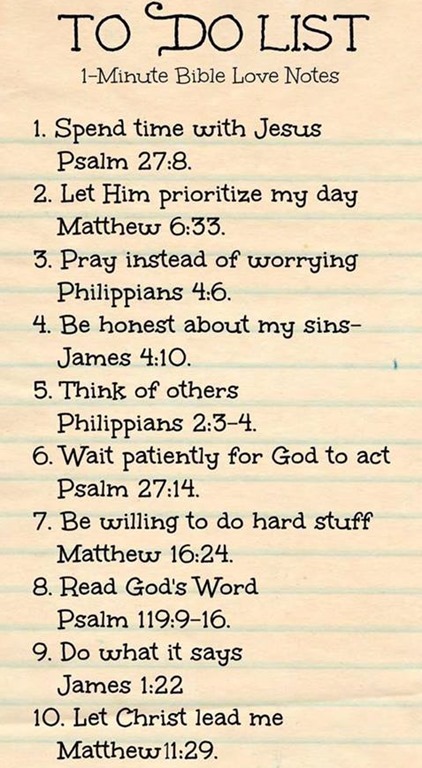 Greetings CLMNWA Family, I haven’t had much to write lately in terms of a teaching series, but I came across something today that I kind of call what has become the title of this new 10 message teaching series: The Christians To Do List. I know that many of you are list makers like me, and I’m equally guilty of not always completing those lists. If I’m being honest and transparent I’m not very good at always completing this Christian To Do List either. 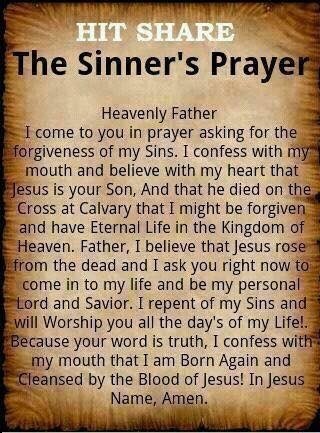 So, let’s take some time to explore this to do list that all of us whosoevers that have called upon the name of the Lord to be saved are, and what the Lord has to say about them. Back around Thanksgiving of last year God began dealing with me about the Mary and Martha story, and as y’all know I’ve really spent a lot of time talking about the “One Needful Thing”. I even wrote a message about it, and over the last few months God has continued to talk to me about the importance of being diligent about spending time at His feet. The most important thing that we can do any day is spend time at Jesus’ feet. As I’ve said many times, I believe that if Martha would’ve sat at Jesus’ feet, and then got up to serve Him that entire story would’ve been different. I’m thankful, however, that Martha didn’t start at Jesus’ feet so that story could be used to illustrate that if we want to have that personal, intimate relationship with God we all desire then it starts with the thing that Jesus Himself said was the “One Needful Thing”. Let’s look at that again, shall we? This is the story the Lord has been keeping on the forefront of my mind since I wrote about it the week after Thanksgiving. From this story came the theme God gave me for 2016 which is “Intimacy With The Father”. This was reinforced a couple of weeks ago when Pastor Cass Hill of Equip The Nations Missions came back to Word Of Life Fellowship Church Bentonville, AR.when he spoke at great length about encountering God, the love of the Father, and how intimacy with God is available to us…but we have to desire to have it…and that’s why spending time with Jesus and at Jesus’ feet is so important. Listen. Church attendance is great. Corporate worship is wonderful. Going to Bible studies and prayer groups is also good. Anything we can do to gather in the presence of the Lord is fantastic. However, there is absolutely positively no substitute for the private, personal time of devotion sitting at the feet of Jesus. There’s nothing like encountering Jesus when it’s just you and Him. I’ve had some wonderful encounters with Him in church services, but some of the greatest moments and encounters I have had with God are when it’s just me and Him. 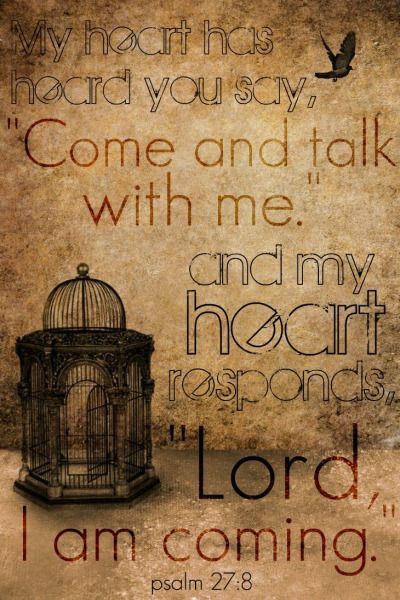 IF we will seek Him we WILL find Him when we seek Him with ALL of our heart. That means some times we have to turn off the television, and be intentional about getting alone with God. It means setting aside everything you feel like you need to do (like Mary), and find that one needful thing Jesus spoke of as she was enjoying soaking in the presence of Jesus. Listen…Jesus says that our heart is revealed by our treasure. For quite a few days the Lord had me ask what is the most valuable thing in your life, and I hear that question once again in my spirit. I’ve come to the place that when I know that the Lord is drawing me into private time with Him there’s absolutely nothing more important to me then taking that time to sit and saturate myself in His presence. I love my Chicago White Sox. I’m listening to the game right now, but I would turn it off in a second to sit at the Lord’s feet. There are increasing times when I know that it’s been too long since I’ve sat at His feet and saturated myself in His presence, and I’ll turn off the White Sox game on my own to do exactly what Jeremiah 29:13 says…seek Him with my whole heart. I don’t know about you, but I’ve started to notice that the things that once held my affections aren’t so important to me anymore. I used to be like a lot of people who rush home after church to turn on the football games, but these days I’ve come to realize that I can check the scores later and continue enjoying the presence of God. I used to plan my week by the prime time line up of my favorite shows on television, and now I couldn’t tell you what’s happening in the shows I used to watch. I still have my favorite television shows, but I’m not as concerned with being home sitting in front of the television when they’re on like I used to be. I love 3 Doors Down, but these days I have more playlists full of worship music. My point in saying all of this is that this is the result of seeking the Father more…you start to have a heart for the things He loves, and the things that aren’t important to your spiritual growth aren’t as important as they used to be. The affections and cares of the world melt away when you spend time in the Lord’s presence, and that’s why spending time with Jesus is the number one thing on our to do list because everything else on our list depends upon how well we do that. Let us remember what He said in John 15, and we will close with Jesus preaching to us of the important of spending time abiding in Him. I got the idea for this series from this photo I found on Facebook, and I’m not sure how quickly we’ll get through the list, and I don’t necessarily know that the list is in order. I do know, however, as I mentioned a moment ago the rest of this list depends upon how important to us it is to spend time with Jesus. So, I know for sure that the number 1 thing on the list in the life of a believer is the most important. I believe by making it a priority to spend time with Jesus that will enable us to make sure that we see to it that we do the rest of them. As I’ve mentioned several times since we began talking about the “One Needful Thing” I believe that if Martha would’ve started at the feet of Jesus with Mary she would’ve been able to get up from His presence serving Him better because she would’ve been serving Him out of a heart of worship instead of a heart of performance. Hey…by the way…if this message blesses you won’t you take a moment to do something simple…like it, share it, comment on it. Let me know that what I’m writing is ministering to you. Please write me and let me know you’ve been blessed or if you need prayer or if you’d like to support Christlike Ministries NWA with a financial gift. I can be reached at christlikeministriesarkansas@yahoo.com.